Reavers killed his kinfolk. Now he seeks a legendary sword-dance … which will probably kill him! Jorgan Anderson, a Northland shipmaster’s young son, is looking for adventure on a routine voyage to the same old ports—and adventure finds him the day they spot a Ty Shing priest floating face-down in the sea. When Reavers slay Jorgan’s kinsmen in a bloody sea-battle, he vows to learn a legendary sword dance for his folk to defend their longships. His adventure takes him to distant Xaichen, a mysterious land ruled by Oshiemin Tu, the Ty Shing priest’s bitterest enemy. Jorgan becomes the Outlander of Ty Shing, a sword-novice mistrusted by temple masters, rejected by fellow students—unwittingly tangled in a forbidden romance, imperial schemes, and an arch-sorcerer’s behind-the-scenes manipulation. Will the young warrior trust the sword or the One? His decision could cost him his life. 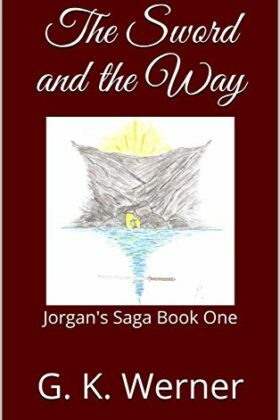 Book 1 of the Jorgan’s Saga series.